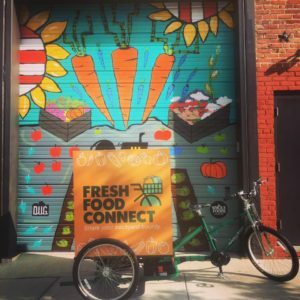 On January 11, 2018, Whole Foods donated 5% of sales to assist in starting new chapters of Fresh Food Connect around Colorado, including here in LONGMONT! This donation is going to purchase electric powered trikes, seed grants, and license fees for the Fresh Food Connect app for each of the chapters. Check out our new ride! We can’t wait to cruise around town on those summer days, enjoying the sunshine and doing meaningful work in our own community. If you can’t tell, we at Longmont Food Rescue are so excited to bring Fresh Food Connect to Longmont. We know so many people with gardens and we hope you pass on the news to your gardening friends too – Do you live in zipcode 80501 or 80503 inside city limits? Then sign up now at www.freshfoodconnect.org. Each week throughout the growing season, you will receive one email regarding your garden produce. You respond whether or not you have produce to donate and if you do, Longmont Food Rescue stops by your doorstep or community garden to pick up your healthy, grown with love, food. We help you SHARE THE HEALTH by getting your excess food to people that can use healthy, fresh, FREE food here in Longmont.